Penny and Charlie Crockett former, educators, coaches, and advocates for all things Windjammer, with a combined 69 years in the Camden Hills Regional School (and its predecessors) were on hand Friday October 6th, 2017, for the dedication of the new cross country trail named in their honor. 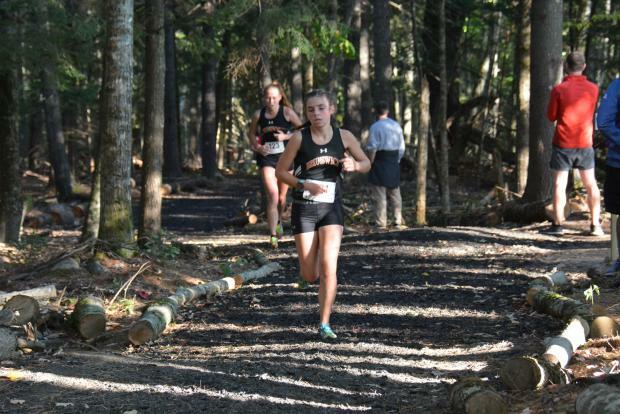 The Crocketts were able to hand out a lot of ribbons and trophies to the Windjammer's girls team as Camden claimed the team title in the nine team invitational meet; Camden put seven runners in the top ten with sophomore Grace Iltis taking the first spot with a new course record of 19:18.97. For the boys race the Crocketts had to content themselves giving ribbons and trophies to the boys from nearby Lincoln Academy. Sam Russ claimed the top spot with a time of 17:29.83 as the Eagles took four of the top five spots the boys' race. 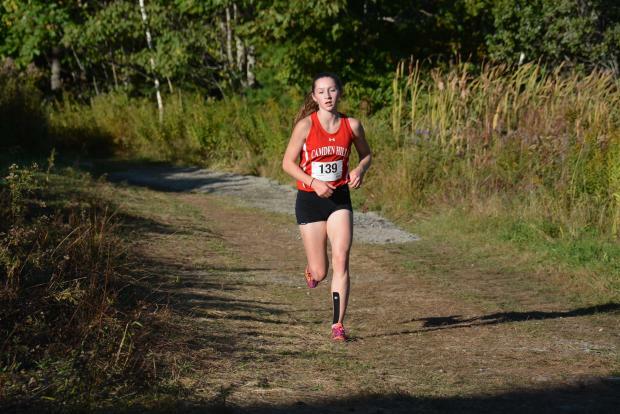 The Windjammer girls had just nineteen points as only Brunswick's Isabella Pols (4th) and Micaela Ashby (5th) together with Morse's Sydney McCarren (9th) punctured the steady stream of red jerseys crossing the line. Other scorers for Camden were Augusta Stockman (2nd), Miranda Dunton (3rd), Phoebe Root (6th), and Claire Wyman (7th). Also taking top ten spots for the Windjammers were Senior Alli Wells (8th), and Rose O'Brien (10th). Due to a timing glitch the only time available for the girls' race was Iltis's first place finish. Brunswick finished second with 56 points. The dragons were followed by Belfast (89), Morse (89), and Lincoln Academy (129). Other teams running but without the five runners necessary for team scoring were Medomak Valley, Oceanside, Nokomis, and Lawrence. Belfast was led by Zoe Deans who finished 11th, Nokomis's Emily Eastman finished 14th to lead her team while Serena Blasius was Medomak's top finisher at 16. Grace Werhle led the Lincoln Academy team, Molly Davis of Oceanside crossed the line first for her team, and Sierra Weston of Lawrence rounded out the team leaders. The new trail follows most of the on-field contours of the old course and finishes with 300 meters on the track just as the old course did, but a new segment running through the woods allows the school to keep the entire two loop 5K course on municipal land. The old course had traversed neighboring private land. The new arrangement simplifies maintenance and makes the overall footprint of the course more compact allowing spectators better access to viewpoints. Approximately a mile of the woods trail consists of a newly cleared trail---trees and stumps were removed over the summer---with a base made up of the recycled materials from the high school's track which had been resurfaced this summer. Conceptually the use of recycled material from the old track is appealing but in practice the base, consisting of a slurry of ground asphalt and rubber, is less than ideal. The particles are fairly large, loose, and won't lend themselves to compaction without the addition of some more finely ground material. Runners described the loose surface as slippery and hard to gain traction in. Even so, the course is a pleasant mix of woods trails, and flat playing fields. There is very little by way of incline so it could, at some point, become a "fast course." (3rd) running together, led virtually the whole way with Russ just pulling away beneath the giant blades of the school's windmill with about 500 meters to go. The Eagles very nearly took the top four spots with Brunswick's Cam Ashby (4th) making a strong move at the last turn on the track to deny Benji Pugh (5th) near the finish line. Brunswick, second in the team competition, also put four runners in the top ten as Will Shaughnessy, running for the first time this season, took 6th. Tyler Patterson, coming off a top ten finish in the freshman race at Festival, was 8th, and Andrew Chingos was 10th. Joining the scoring for Lincoln Academy was Jojo Martin with a 12th place finish. Closing the scoring for Brunswick was Daniel Lyons (13th). The Eagles finished with with 23 points to 41 for the Dragons. Third place went to Belfast (87), the Shipbuilders of Morse followed with 105, the host Camden Windjammers were sixth (108) while Oceanside closed the team scoring at 178. Also running but without the numbers for a team score were Lawrence, Medomak Valley and Nokomis. Russ's winning time for Lincoln Academy was 17:29.83. Ashby's 18:11.89 led Brunswick. Ricky Smith of Belfast had a top ten finish as his 18:36 was good for 7th, while Morse's Connor Freeman (9th) took the other top ten spot. Josiah Webber (23rd) led Lawrence with Isiah Potter of Medomak (24th) right behind him. Will Karod was first across the line for Oceanside, while Samuel Roy led Nokomis. The two team winners head into the KVAC meet next Saturday at Cony as favorites. The Lincoln Academy Boys should cruise to the KVAC Championship in Class B. Meanwhile the girls of Camden, competing in Class A for the first season, are the favorites to take the title but they'll face a stiff challenge from Mt. Ararat. The Eagles of Mt Ararat haven't run anything approaching a fast course this season and there is no head-to-head data. Meanwhile the Windjammer's sparkling numbers are based on last week's torrid performance at Festival of Champions, a race the Eagles of Mt. Ararat have traditionally eschewed.